Sieve the flour and salt into a large bowl, sieve the baking soda through a fine tea strainer into the other dry ingredients and mix well. Using a whisk works well as this helps to keep the air in the mix. Using one hand, and holding it like a claw, mix the flour and milk from the sides of the bowl, adding more milk if necessary. The dough should be soft. If it is wet and sticky it can be corrected later in the process. Turn out onto a well-floured surface – you can be more generous with the flour than you would be if you were kneading a yeasted dough. If necessary, wash and dry your hands. Then quickly form the dough into a round and put it onto a prepared baking tray. Pat it down about an inch thick (2.5 cm). Cut a cross in the top to let the fairies out. This should go about halfway through. Bake for 15 minutes before turning the temperature down to 200C, 180C (Fan), 400F, Gas Mark 6 for a further 20-30 minutes. Test the loaf by tapping the bottom. It should sound hollow if it is done. If not, give it an extra 5 minutes and check again. All measurements are in grams, though liquid may be measured in millilitres – with water-based liquids (milk, wine, vinegar, yoghurt etc) grams and millilitres are the same. Quantities are based on the magazine article in Home Farmer, comments are mine and anything that goes wrong is down to me. These are the quantities exactly as given in the magazine. I ended up with 717 grams of ginger so I increased all quantities by 280%. – 1.4 kg sugar and 1.4 litres of total water. There should have been 560 ml of cooking liquor, but there was only just over 400 ml. Peel the ginger and cut to size. I aimed for around 1 cm square as I was going to put them in small hexagonal jars. Based on what you buy in the shops you could go for something a bit bigger. Cover with water – bring to the boil and simmer for 40 minutes. I did it for a bit longer, getting on for an hour, until I could get the point of a knife into it quite easily. If I do it again I will probably use enough water to give me the right amount of cooking liquor. Take the ginger chunks out and drain. measure out 200 ml of cooking liquor for every 250 g of ginger. Make the total water up to 500 ml per 250 g of ginger and add the sugar. Heat gently to dissolve the sugar. I used ordinary sugar instead of caster – it seemed to do the job alright. Simmer the ginger in the syrup for 5 minutes (I did 10 just to be sure). 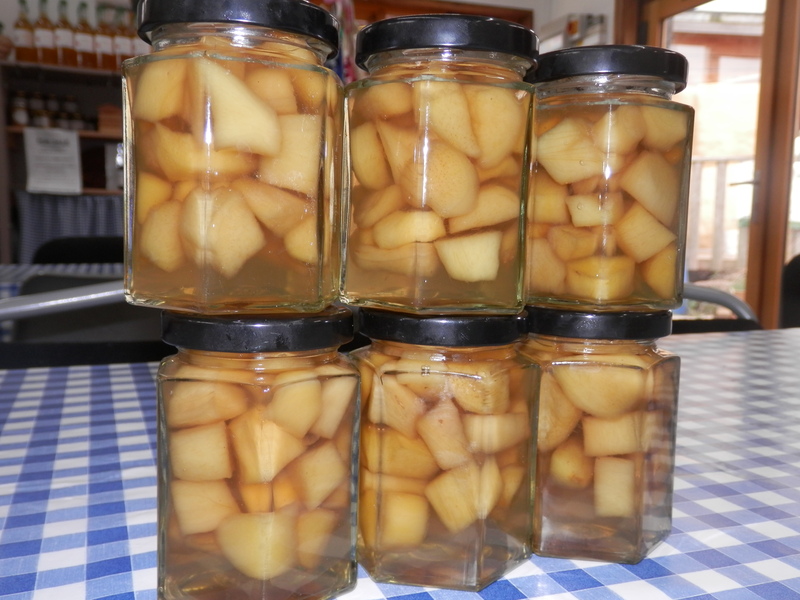 Drain the ginger and put in sterilised jars (see below). Boil the syrup to 104 degrees C. I used a probe thermometer to check this. I know there are other ways of testing jams and jellies but not sure about syrups. Allow to cool slightly and pour over the ginger in the jars. No, not sure why or what constitutes “slightly”. I washed a few jam jars then went back to it. Seemed OK.
Screw the tops on and agitate the jars or tap the sides to ensure there are no air bubbles trapped in the syrup. Store in a cool dark place for 3-4 weeks to mature. It should last about six months but store in a fridge after opening and eat within three weeks. To be honest, with that amount of sugar it should last longer but recipes always err on the side of caution. Bottle the remaining syrup (four 250 ml bottles in my case) – use it on ice cream, and in drinks. I’m going to have to look for more uses. I think I would reduce the quantities if I do this again as I don’t really need a litre of syrup. There are quite a few ways of doing this, including using a dishwasher (as long as it goes to 80 degrees C, boiling water, Milton fluid, microwave and putting them in the oven. Having looked at many ways I now wash jars or bottles thoroughly, let them dry and put them in an oven set for 150 degrees. Once it reaches that temperature I consider the sterilising is complete. If you don’t let the glassware dry you can end up with marks inside the bottles as they dry in the oven. Don’t put hot stuff in cold jars or cold stuff into hot jars as they may crack. Also, and I found this out the hard way, don’t put very hot stuff into very hot jars, even if you are in a rush. Doing so may make your jam boil quite violently in the jar and it may shoot out and coat the back of your hand and wrist in molten sugary jam. If you do this, wash the jam off immediately and keep your hand in cold water for at least 15-20 minutes. I escaped with just a red patch and a mild tingling sensation that passed after a few days. Boil in a pan for 5 minutes and drain on kitchen roll. When bottling juice tip it on its side after pasteurising so the hot juice touches the inside of the lid. 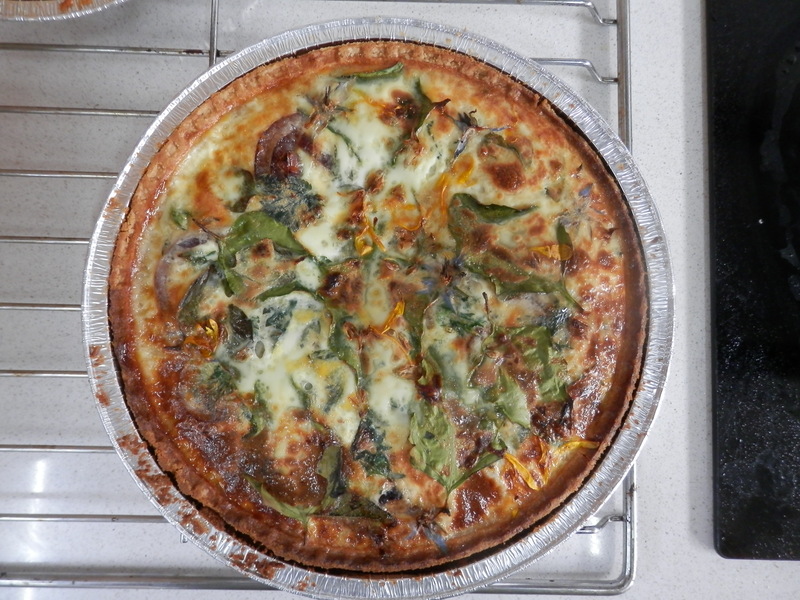 December 2015 – gave some away and ate the rest over Christmas. The earthy taste that had been there after 4 weeks had disappeared and the ginger was significantly hotter than shop-bought ginger in syrup. I’d say this was a success. It must be doing some good because it’s green and you can taste the iron! Slice the onion and potato and gently fry to soften. After about 10 minutes add the water and stock cubes. When the potato is fully softened add the Fat Hen. Boil for a couple of minutes to soften. Blitz it with a stick blender. Carefully! That’s it. Basic Fat Hen soup. It’s ready for a mass tasting so I’ll probably have a few suggested additions next time I write..
Takes about half an hour plus picking time. Nettles and Fat Hen are both high in minerals and vitamins so you’re doing yourself good with this – and it has a good, fresh taste to it. as well. 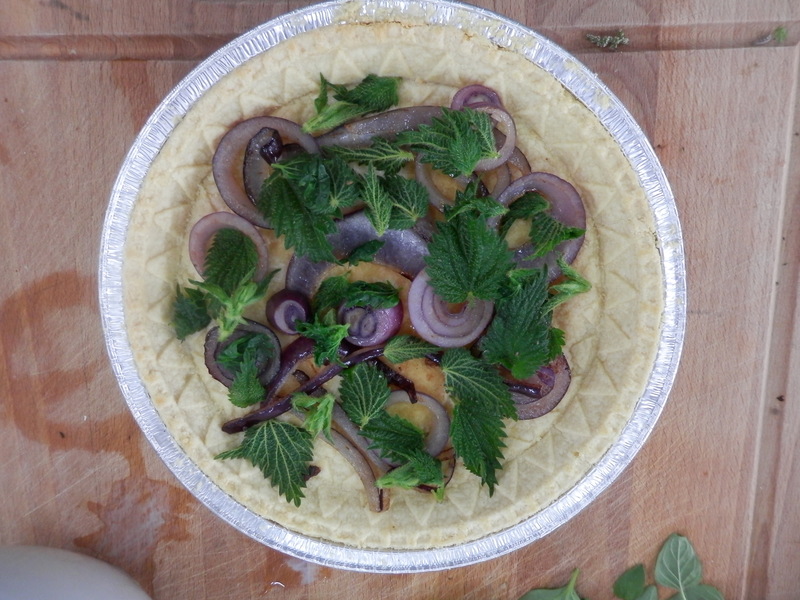 For the filling: Half an onion, nettle tops and small Fat Hen leaves (enough to fill the case). I also threw in some marigold petals, borage flowers and broken up chive blossoms but apart from the odd small splash of colour I don’t think they did anything. Good sprinkle of nutmeg. Salt and pepper to taste, a little oil to soften the onions. Mix milk and egg and pour on – there’s often a bit left, depending on the size of the case – you may be able to get away with a bit less – I keep meaning to see how far 250 ml goes. Just add blackcurrant vinegar and rapeseed/vegetable oil in a ratio of 1:1. I suppose it depends on the blackcurrant vinegar but this delivered a punchy dressing that was very popular last time we had wild salad. I will do a blackcurrant vinegar recipe soon as we are just picking currants now. Presumably you can use more sophisticated oil, but if the cheap stuff works I like to use it. Tends to separate so shake it before use. The name could do with a little work, but the dressing is good. Equal parts of Chive Blossom Vinegar and rapeseed/vegetable oil. Add some runny honey to take the edge off the vinegar and some mustard for texture. How much? Well, to tell the truth I’ve forgotten. Try a couple of teaspoons of each and work your way up. I think I used about four of each in 200 ml of dressing. I will try to remember to measure things next time. Pick enough nettle tops to fill about half a teapot, or the bottom of a cup, shake and let them stand until the bugs crawl out. Pour in boiling water. Leave to brew (one recipe I’ve seen suggests ten minute)s. It produces an earthy tasting tea, though it does have a bit of a tingle, just like eating nettle soup. I assume it’s the formic acid but I’m not qualified in botany so that’s just a guess. It’s probably doing me good but it’s not providing a pleasurable drinking experience. I’ve been advised to make Mint and Nettle tea for a more palatable brew. Second attempt: This time I accidentally made nettle tea whilst blanching some nettles for a quiche. The boiling water I poured on the nettles turned green and after fishing the nettles out I drank it. Brighter green than the above attempt, two minutes brewing – nice fresh taste. May not have all the goodness of tea brewed for 10 minutes but it tastes a lot better! Take enough fresh leaves to half fill a teapot or the bottom of a cup. Shake out the bugs and allow a few minutes for them to crawl out. Cover with boiling water and let stand until it takes on a nice green colour. Can turn quite brown if you leave it brewing, or if you use some of the darker-leaved mints. 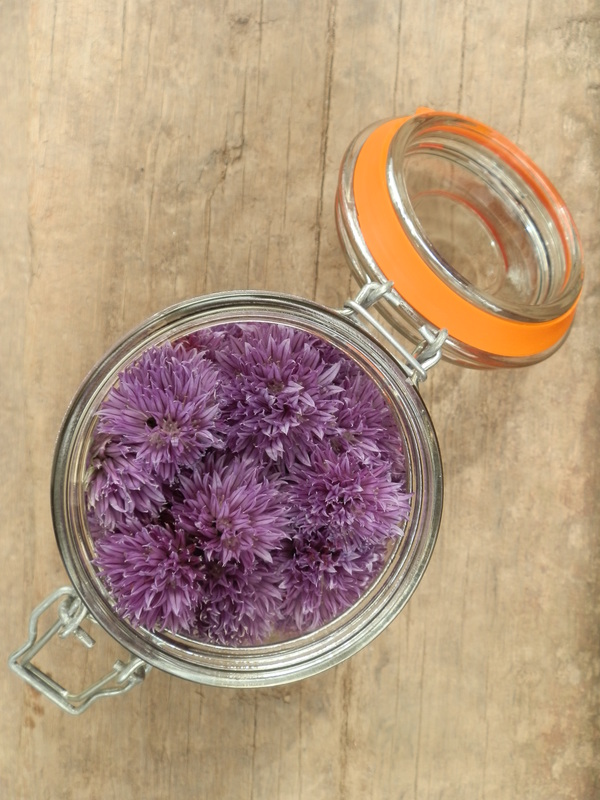 Enough chive blossoms to fill a preserving jar – cut close to the top of the stalk, but not so close that the flower falls apart. I used White Malt Vinegar for one jar and Cider Vinegar for the other. You see all sorts of vinegars recommended – I just used what I had in the cupboard. The one on the left is the white malt vinegar version. 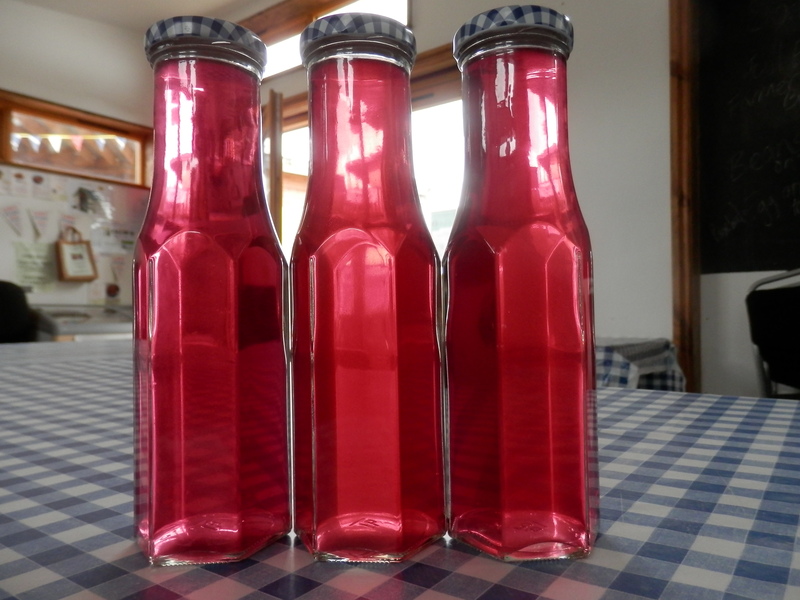 The camera doesn’t really pick up the difference but it is a brighter pink than the cider vinegar one in the centre. The one on the right is blended. Let the flowers rest for a few minutes on the work surface, which gives bugs a sporting chance of walking away. Wash thoroughly. Spin in a salad spinner or whatever you use. Don’t squash them. Heat the vinegar until it is nicely warmed through. I did one at blood heat and one a bit hotter because I forgot it was on. It was still a way off boiling though. The hotter one produced the quicker colour change in the jar, but after three days they were pretty much the same colour. Fill a sterilised jar with flower heads – I used a preserving jar because I had a couple empty and you don’t need to protect the lids from the vinegar. Pour the warmed vinegar over the flowers until they are submerged, pushing them down if necessary. Let it cool and put the lid on, protecting metal jar lids from the vinegar with a waxed disc or square of parchment. Leave in a cool, dark place for two weeks – or longer if you are patient. Strain it through muslin or a fine plastic sieve and decant into a suitable sterilised serving bottle. 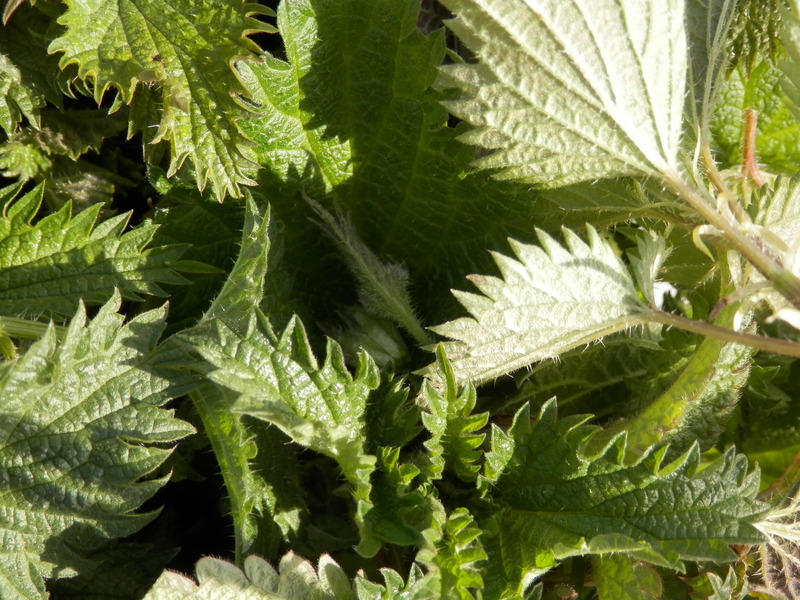 Probably one of the simplest nettle soup recipes you’ll find. You can make it with 100% nettles if you want but at this time of year I’m struggling to find enough nettles in the time I feel like devoting to picking. This ratio still gives a good nettle taste. When the potato is fully softened add the spinach and nettles. Give them a few minutes boiling to get rid of the stings. Liquidise it with a stick blender. Or if you like a safer method, let it cool and liquidise it with a stick blender. Do it somewhere that you can wipe down easily. That’s it. 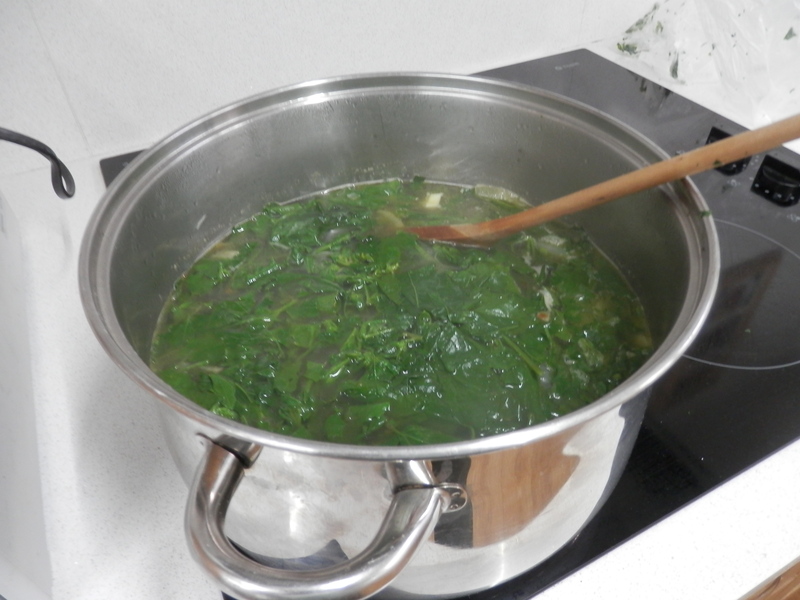 Basic nettle soup. Takes about half an hour plus picking time. Probably serves 4. Sorry I’m a bit vague on this – what usually happens is that we give out small portions to twenty kids, with lots of them refusing to eat it. 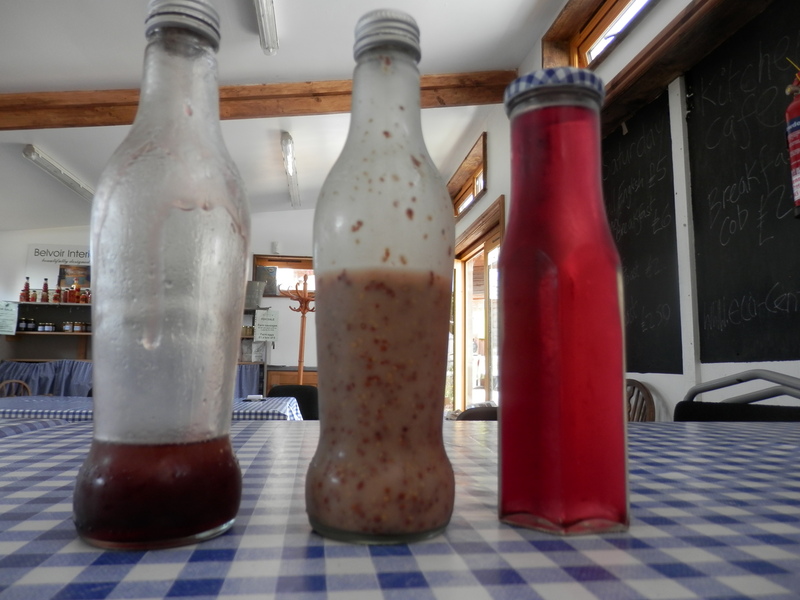 Last Saturday I made three litres, meaning to take some home, and 15 Guides plus helpers managed to polish the lot off. You never can tell. 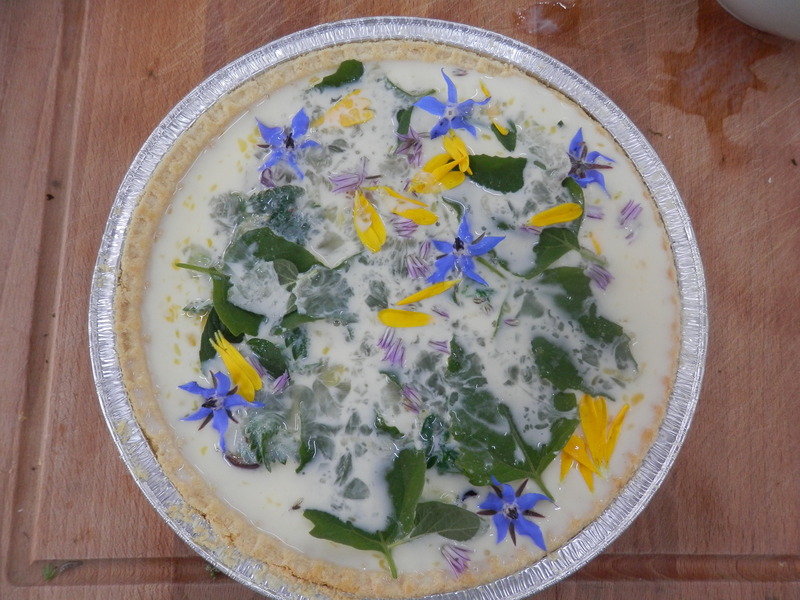 Variation: 100g of nettles and 100g of mixed greens from the garden – chard leaves, rocket and a few chives (careful – they pack a lot of flavour in a small weight).